In the near future, signs and portents have begun to appear that point to a rushing cataclysm. Both political and religious world leaders see the patterns, and the scientific community confirm evidence of what they call “a dark matter” that is expanding into our universe, threatening the very fabric of our world. But it will not be governments or religions upon whose actions the fate of the world rests. Rather it will be up to a small diverse group of men and women who will have to decide to use their free will to aid in the last great cosmic battle between good and evil as these apocalyptic forces clash—both here on Earth and on the Other Side. An internationally renowned psychic, John Edward has helped millions of people to connect with loved ones on the Other Side. 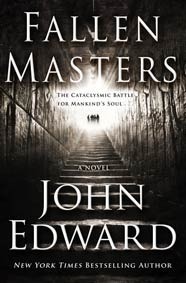 In Fallen Masters, Edward has written a riveting novel of metaphysical suspense, a final confrontation between good and evil as it unfolds on both the Earthly plane and the Other Side.